Pegasus, or Pegasos as he was called by the Greeks, was a winged horse, born from the liaison of the sea-god Poseidon and the beautiful Medusa. The liaison made the goddess Athena angry, and she cursed Medusa to be ugly and deadly. When she was killed, Pegasus sprang from her neck. (See my page on the story of Medusa). It's easy to speculate on the origin of the idea of a winged horse. A horse that seems as swift as the wind .. an exceptional horse .. might seem to fly, and might be talked about as flying. And the flight of Pegasus can be used as a metaphor for the soul's immortality. In legend, Bellerophon, who became king of Corinth, tamed Pegasus with the aid of a golden bridle given to him by the goddess Athena. 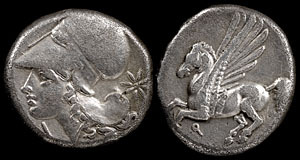 So Pegasus appears on many coins of Corinth and her colonies. He appears on other ancient coins too. Here are some of them.